The built in mail client is one of the new and upgraded application in new Mac OX S 10.7 Lion. It is upgraded to version 5 with lots of new features like the mail client in latest iPad and iPhone. You can find out more information onwhat’s new in lion mail client here. 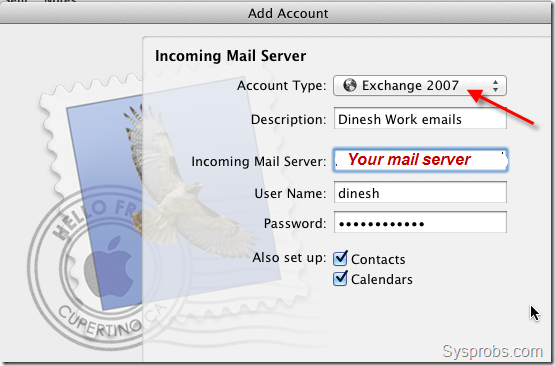 This small guide shows how to connect Exchange 2003 and Exchange 2007 in Lion Mail on OS X 10.7. 1) Select Add account and enter basic details of your email. If the Exchange 2007 is meeting all requirements to talk with Lion mail properly, then it should detect the settings automatically. 2) Go to next screen and enter more details about mail server and connection type. Make sure ‘Contacts’ and ‘Calendars’ are selected for synchronization. Unfortunately, my office mail server doesn’t support the minimum requirement, so it throws the following error. Anyhow, I pressed Continue and reached the next step. 3) If SSL is enabled in your email server, then select ‘Use Secure Sockets Layer (SSL)’ tick box. Check the summary and create the account. That’s it, we have successfully connected Exchange 2007 with Lion mail. This method will ensure the proper synchronization of your email folders, calendars, contacts and Global address list. There are two more options available to connect Exchange 2007 in Lion mail client. Your mail server should support these two connection types. User name can be typed alone ( ‘dinesh’) or username@domainname ( dinesh@sysprobs.net) or domain nameusername ( sysprobs.netdinesh), this depends on the settings in mail server. As you must aware, IMAP will synchronize your email folders (including sent items, trash, draft) and subfolders only, not the calendars or contacts or global address book. There could be some non-straight forward methods available to make this work, but not easy and sure. POP will download your inbox emails only, not the sub folders or sent items or calendars or contacts or Global address list. To leave the email messages without removing from server while using POP in Lion mail, make sure touncheck the below box or adjust the duration in drop down box.